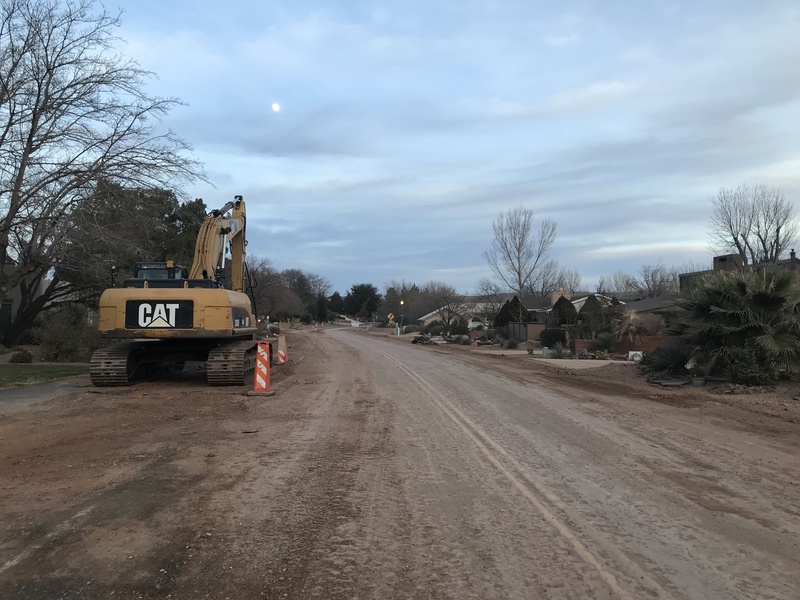 OPINION — The improved engineering and repaving project on Bloomington Drive in the Bloomington neighborhood of St. George is coming along very nicely and certainly a welcome relief to what most of those living in Bloomington have had to deal with over the 50 or so years of its existence. It has, however, a built-in challenge that has been amplified with the brand-new pavement. While the speed limit is 25 miles per hour, few of us including this writer always obey this limit. Yes, I am guilty, and I own it but some have taken speeding to all new heights where the new pavement has been laid. I have always felt that it could be just as safe at 30 mph and I admit that when it’s safe to do so, I edge up at times. Others seem to think that 40, 50 and even 60 mph is a safe operating speed on the loop and with the new paving on the straight stretch, on the southwest side, this has now become the norm, until they hit the curves on each end of the segment between Navajo Drive and Ute Road. Then things get a little squirrely at the higher speeds as they enter the turns. I have watched people speed by the workers installing the new water lines and dressing up the landscaping, pouring concrete for the new manhole covers with little disregard for life and property. Everybody is in a freaking hurry but is it worth it? Some think the warning cones and pylons around the open manholes mean it’s a gymkhana course and whip through them as fast as they can, even going down the wrong side with oncoming cars coming toward them. Then there is the little stretch past Bloomington Country Club towards Tonaquint Drive, specifically the first curve by the club’s adjacent maintenance facility and driving range; on the northeast side of the parking lot, it comes fast at 40 mph. I have seen people pulling out of the country club, on the pool end, in front of speeders causing near collision situations. I have seen people almost lose control as they come up too fast on that curve and get the right wheels of their vehicles in the dirt. Sooner or later, there will be a collision or a rollover. At the initial presentation for the construction project, I lobbied for soft speed bumps on the stretches where people are more prone to speed but I got shot down. They said “it was too dangerous and could cause damage to cars and the city could get sued.” I don’t buy that if there were warning signs posted. What about the elderly people walking their dogs or just out exercising? What about the runners with earbuds blasting in their ears so they can’t hear cars coming? What about the cyclists who love the challenge of riding the cycling lane … on the painted line? What about children riding bikes and skateboards? What about people pulling out of one of the many cul-de-sacs and misjudging a speeding car? What IF someone loses control while SPEEDING and hits someone and damages their precious car and kills or maims a fellow human being in the process? Speed controls might not be such a bad thing … but please, not as low as 25 mph – 25 mph is just juvenile. There is no traffic control on Bloomington Drive. We rarely see any police presence. There is little signage and none of it warns of pedestrians or bike traffic. I have asked for the portable speed warning signs a number of times and while promised I have never seen one put up, although I’m told they have been there from time to time. In this letter, I have only touched on a couple stretches where speed is disregarded. There are other areas that need to be addressed. It is literally the wild west of speeding from Navajo Drive to Ute Road. And from what I have seen here in Bloomington and other parts of St. George, pedestrians evidently do not have the right of way as prescribed by law. The mayor, City Council, Bloomington Council and chief of police probably need to reassess traffic control in Bloomington now that we have a nice new road and while they’re at it, let’s take some action to curtail the speeding. Written by PAUL LINFORD, St. George. Traffic control is virtually non-existent in Washington fields. No police presence is evident unless there is a serious accident. Cars and especially construction traffic exceed speed limit by ten or even twenty miles per hour regularly. The city has been notified countless times by residents along with local home owner associations and promises by the city to patrol the area are made but it never appears to happen. Cement trucks, dump trucks and other very large construction vehicles pound the streets continuously with little attention to children going back and forth to school and other activities. The traffic and the roads remind me more of a third world border town then what I have been accustomed to here in other American communities. What goes. Is their no respect in Dixie for public safety? One just needs to look at the high numbers of automobile accidents here in the county and the problem becomes very apparent. Government leadership should be publicly criticized for apparently ignoring the situation. Where is the outrage? A lot of people are going to get injured if this is not given serious attention soon! Demand STG police dept is fully staffed, especially traffic control units. That’s part of the problem- so many seniors on fixed incomes and anti-government types wasn’t agree to more cops, even though it’s obvious there aren’t enough. People probably don’t realize the majority of St George fire stations are not staffed, either. Citizens demand public safety but don’t want to pay for it. That biggest cost in public safety is the cost of employees, approaching 90%. You want more cops and firefighters, open your wallet. In the meantime, speed bumps… BIG ones… would slow people down. That’s not the only place they’re needed. Ft Pearce could use some, so could Tamarisk. Don’t blame the police…put the blame where it lies – the drivers! Were you not brought up to be courteous and obey the laws? Did you not instill these same principles in your children? Your grandchildren? isn’t common sense needed here? Do you not follow the commandments of whatever faith you follow? It’s not “do unto others before they do unto you” but rather “do unto others as you would have them do unto you”. Practice what you preach, practice common courtesy and have some sense of passing it along. And start now! It is sad that we, as a people, ask for government intervention so often. It is too bad that we haven’t learned from the past and learned to govern ourselves. If everyone who travels this road would just take it upon themselves to slow down and be a bit more cautious and courteous, there wouldn’t have to be an incident that creates more intervention. It isn’t too much to ask. Slow down. Be respectful of another. Apparently you folks didn’t get the memo. “It’s all about ME!” This seems to be the attitude of drivers anymore. And, blieve me, it isn’t just here in Dixie. One poster asked if there is no respect for public safety. The answer to this question is obvious every time you get behind the wheel. Please, no speedbumps. As a driver, they’re irritating. (That’s the point, I suppose) As a pedestrian trying to cross the street, it makes it hard to calculate how much time I have to cross. Cars are accelerating, slowing, repeatedly. It becomes a bit of an arcade game. We need all sorts of things – better/more law enforcement, better schools, better infrastructure, etc., but the second a politician proposes a tax increase (you know, the way these things are paid for) everyone suddenly changes their mind. Humans are selfish and stupid and, especially those on the right, are against tax increases for any reason and so this is what we get. Either pony up or shut up. In Washington, there is no traffic speed enforcement. If you drive the speed limit, especially on Telegraph, you get run over. I have lived on Bloomington Drive for over 20 years, and the speeds are out of control in front of my house. I become outraged many times by the high rates of speed when young children were playing at my house. I have called the parents of teenage drivers. The one good thing that has come out of this is I am much more aware of my own speed when I am driving in a residential neighborhood.